Very pretty! Great videos, love watching you. This is a great stitch! I look forward to your teaching episodes! I too enjoy watching you.. Thank you! How pretty! And surprisingly easy as well, a double win win. Ah yes! You're right. I did do four repeats instead of only three! Nice catch. Hi there! 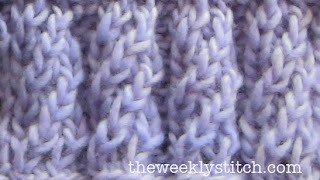 I always start with the first row of the pattern - but certain stitches can be a little tricky on the first row and I find it easier to work a plain knit row first, then start the stitch pattern. Hi! Can you make this Spiral Stitch in the round? Isabel there is a link at the top of the blog with info on converting stitches for circular knitting. 'Mommy! Are you working??". So cute. :-) And a great stitch, too. I'm going to use it as one of the squares of a quilt I'm making. Thank you! 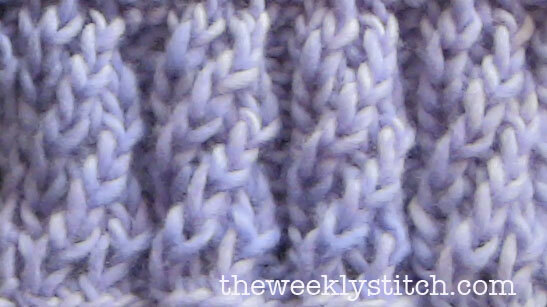 How do you knit this beautiful stitch in the round?